Many of today’s caravan parks are eco-friendly, plonked on some of the best coastal or inland real estate in the country, and offer facilities bordering on resort-level quality. As an option for travellers on a budget, they are not to be mocked. Here’s AT’s pick of the parks that are doing it properly. Yamba, known to most as a quaint fishing village and surf spot, is becoming famous for its caravan park. Topping most travellers’ lists as the ultimate caravan park to spend a family holiday, the Blue Dolphin combines three important features: location, relaxing atmosphere and activities to entertain the kids. Located at the mouth of the mighty Clarence River, the park is set among 15 acres of tropical gardens and is close to seven nearby surfing beaches, an 18-hole golf course, and a bowling club – all of which bask in the sun of northern NSW year round. Don’t miss: Sampling a Yamba Prawn. Details: From $30/night, Yamba Rd, Yamba (02) 6646 2194. Cape Byron is the most easterly point of Australia’s mainland, and so, situated right on the foreshore of Byron’s main beach, this holiday park really does enjoy views of the first sun each day. There’s not much to obstruct its guests views, either; the sites are located right on the main beach foreshore. Over the years, Byron has become a Mecca for groovy lovers of fun, sun and all things alternative. This park is located just a short walk from all major attractions so you won’t miss a beat. Don’t miss: A leisurely stroll to the Lighthouse and its stunning views of the South Pacific Ocean. Details: From $50/night, Lawson St, Byron Bay, www.bshp.com.au/first, (02) 6685 6544. An easy two hours south of Sydney, Jervis Bay is the perfect place to spend the weekend or an extended break. Far enough away to relax, this park boasts spotless facilities and stunning surrounds. But if you tire of lazing in the crystal clear waters or wandering through parklands, you do have other options: just walking distance from the town of “Husky”, this caravan park is close to specialty stores, restaurants, cafes, the local pub and much, much more. Don’t miss: A visit to Hyams Beach, reputed to have the whitest sand in the world. Details: From $35/night, Beach St, Huskisson, 1300 733 027. Home to some of Australia’s most stunning coastline, Esperance’s beaches are considered among the best in the world. The Esperance Seafront Caravan Park is right on the seafront of Esperance Bay just 50m from a safe swimming beach (so all the sites have ocean views) and two klicks from the town centre. Perfect for exploring the rugged national parks of Cape Le Grand, the nearby pink lake and the cobalt blue water of the Bay of Isles. Don’t Miss: The resident sea lion that lives under the nearby fishing jetty. Details: From $26/night, Goldfields Road, Esperance, (08) 9071 1251. On everyone’s to-do list is swimming with dolphins. Monkey Mia is one of those rare places in Australia where dolphin visitation is daily, rather than seasonal, and the Monkey Mia Dolphin Resort offers a human-dolphin interaction program for free. 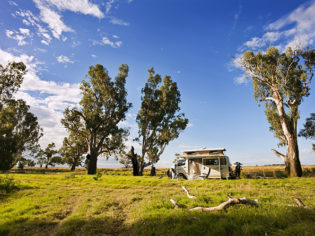 This absolute beachfront camping resort is in the heart of the Shark Bay World Heritage Area. Don’t miss: Snorkelling or boating in crystal clear waters, a camel ride or an Aboriginal Cultural Walk. Details: From $31/night, (08) 9948 1320. If you’re planning a trip out of season but still want to bathe in warm ocean waters without getting attacked by stingers, head to Peoples Park Caravan Village, Coral Bay. It’s blessed with perfect weather year round and is situated at the southern end of the stunning Ningaloo reef. Don’t miss: Swimming with whale sharks, manta rays, reef sharks and loggerhead turtles. Details: From $32/night, Lot 11, Robinson St, Coral Bay, (08) 9942 5933. This multi-award winning BIG4 camping resort is a parents’ dream. It has so many activities to keep the kids entertained, you’ll hardly see them. Even though this resort is just seven minutes from the town centre, you won’t want to leave as all the activities are free and include three swimming pools, tennis courts, 18-hole minigolf, volleyball, badminton, basketball, huge adventure playground and enormous jumping pillow and outdoor movies (to name a few). Don’t miss: A stroll through the 28acres of immaculate grounds, rainforest areas and tropical gardens. Details: From $36/night, Corner of Bruce Hwy and Anderson Rd, Cairns, (07) 4054 6644. Less than two kilometres outside of the historic mining centre of Charters Towers, you’re in for country hospitality and first-class (clean) facilities – the Park’s award-winning point of difference. Owners Gayle and Don Peters really do go the extra mile to make guests feel at home. Whether this is by providing info about the sites around Charters Towers or by placing freshly picked flowers in the ladies toilets, their service is tip-top. Don’t miss: Toasting marshmallows at Dalrymple’s campfire – a great spot to meet fellow travellers. Details: From $25/night, 24 Dalrymple Rd, Charters Towers, (07) 4787 1121. This little gem is filled with happy campers that call out “another day in paradise!” as they pass one another at the shower block. The stunning coastline around Sunrise at 1770. Guests can catch their own mud crabs and fish for dinner, and what it lacks in facilities it more than makes up for in natural attractions, allowing campers to relax and reflect. But make sure you call early to reserve an absolute beachfront site as these book up quickly. Don’t miss: A day-trip out to Lady Musgrave Island. Details: From $27/night, 641 Captain Cook Drive, Agnes Water, (07) 4974 9286. Noosa was established as a hippy commune in the ‘60s but now, unlike Byron Bay, the hippies have been totally replaced by yuppies. Although Noosa’s laidback atmosphere has remained the same, its prices have sky rocketed. This Park provides travellers with an inexpensive place to stay just a stone’s throw away from the centre of town. Don’t miss: A trip to the Eumundi Markets and a stroll among the beautiful people along Hastings St. Details: From $28/night, 143 Moorindil Street, Tewantin, (07) 5449 8060. Whether you visit Kakadu in the wet or the dry, its natural beauty is unrivaled as a wilderness destination. The wild and untouched beauty of Kakadu National Park in the Northern Territory. So, when exploring this World Heritage-Listed area, why not stay right in the thick of it? On the fringe of Jabiru Township, Kakadu Lodge is just three hours west of Darwin and perfect for accessing the entire park. When you return to the park after a day of touring, you can relax by the lagoon-style pool (no crocs!) or at the Poolside Bar and Bistro, surrounded by lush tropical gardens. Don’t miss: A tour of Ubirr for some of Kakadu’s awe-inspiring rock art galleries. Details: From $32/night, Jabiru Drive, Kakadu, (08) 8979 2422. For lovers of natural beauty who don’t wish to hike endless kilometres in search of the best waterfall or rock formation, Litchfield National Park is the place for you. Tolmer Falls, Litchfield National Park, NT. Batchelor Resort is the perfect stepping-off point from which to explore this unspoilt landscape (one of the oldest in the world). Just 15min from Litchfield, this park makes caravanning easy; not only is there a mini-mart and fuel pump on-site (unleaded and diesel), but the park can organise for tour companies to collect guests from the front of the park and return them at the end of the day. Don’t miss: The Lost City rock formations, the termite mounds and Florence Falls. Details: From $30/night, Rum Jungle Rd, Batchelor, (08) 8976 0123. Characterised by cascading waterfalls, soaring red cliffs and quirky boabs, Katherine and surrounds is a must-see for any traveller – and Knotts Crossing Resort is at the heart of it all, set among acres of tropical gardens and just a two-minute walk from the Katherine River. Don’t miss: Where do we start: canoe the Katherine River; cruise along Katherine Gorge; explore the Cutta Cutta caves; or bathe in nearby hot springs. Details: From $30/night, corner of Giles & Cameron St, Katherine, (08) 8972 2511. Introducing Australia’s first tourist park specifically designed for people travelling with their four-legged best friends! The park includes fenced areas for dogs to exercise off-leash, a hydro-bath hut, luxury day-use kennels and a dog-friendly playground. But when you do want to leave your dog behind to sample some of the areas highlights, you can, since all caravan sites are individually fenced. The park managers also organise a range of dog competitions to keep you and your pooch entertained throughout your stay. Don’t miss: A trip to the local waterfall and a swim in the natural rock-formed swimming pool. Details: From $35/night, Tarra Valley Rd, Tarra Valley, Yarram, Vic, (03) 5186 1216. The Great Ocean Road is synonymous with leisurely driving holidays. Views of southwest Victoria’s crumbling coastline captivate travellers, as do the historic towns that they pass. Situated smack bang on this historic road is the Anglesea Beachfront Family Caravan Park, nestled among bushland and fronting both the beach and the river. Bush walks and mountain bike tracks are on hand, as is the famous Bells Beach just around the corner. Don’t miss: A round of golf at the Anglesea Golf Course where you can gaze out to sea between strokes and even pat a kangaroo. Details: From $32/night, 35 Cameron Rd, Anglesea, (03) 5263 1583. Home to the famous Penguin Parade, Koala Conservation Centre, Churchill Island heritage farm and Nobbies Centre, it’s no surprise Phillip Island has been named one of Australia’s top tourist destinations. The nightly penguin parade on Phillip Island, Victoria. Set right on the beachfront and wallowing in nature (wildlife, penguins, seals, koalas, mutton birds) with spotless facilities and shady sites, staff at this BIG4 caravan park make it easy for guests to enjoy their stay. Don’t miss: The Penguin Parade; each night at sunset the world’s smallest penguins, the Little Penguins, come ashore after a day’s fishing at sea. Details: From $28/night, 24 Old Bridge Rd, Newhaven, (03) 59567227. The rugged mountains that rise above grassy plains to form the Flinders Ranges are more than 600 million years old. Aboriginal Dreamtime stories that tell the tale of how this area was created have been passed down for more than 40, 000 years. In the Northern Flinders Ranges, Arkaroola Tourist Resort contains some of Australia’s most spectacular mountain views and offers numerous eco-tourism-accredited guided tours. As it’s a wilderness sanctuary, whether you love bird watching, bushwalking, geology, wildlife spotting or 4WD adventures, this park offers a multitude of activities (they even have three fully equipped observatories). Don’t miss: Banquet in the Bush – a five-course meal held at an open-air dining area on the banks of Wywhyana Creek and Wilpena Pound. Details: From $20/night, Northern Flinders Ranges, (08) 8648 4848. Some of the best wines in the world come from the Barossa: Penfold’s, Seppelt, Jacobs Creek and Wolf Blass to name a few. Tucked away just over an hour from Adelaide, this park is minutes from pretty Tanunda at the heart of the Barossa. Guests can hire bikes and take in the vine-clad hills, rustic buildings, Lutheran churches and grand wineries distinct to the area. So make sure you pack wine glasses when you set off on your next caravanning adventure. Don’t miss: A trip to the farmers’ market, held at the Vintners Sheds near Angaston every Saturday morning, followed by a complimentary glass of wine at one of the countless cellar doors. Details: From $26/night, Barossa Valley Way, Tanunda, (08) 8563 2784. Travellers in the know have long been lured to Robe’s protected beaches and fishing-village atmosphere. And, like the township itself, the Robe Long Beach Caravan Park operates at a slower pace, allowing you to really unwind. It’s a BIG4 Holiday Park, so naturally the facilities are clean and modern with staff that provide impeccable service. The red and white striped obelisk is a landmark in the seaside town of Robe (photo: Michael Wee). The Coonawarra Wine Region, Mount Gambier or the Naracoorte Caves are just over 100km away, but if you want to stay closer to home, historic Robe has many boutique shops and eateries. If you’re interested in staying at any of the BIG4 Caravan Parks, make sure you check their website regularly (www.big4.com.au) as they offer great regular deals and specials. Don’t miss: Four-wheel driving on the beaches and dunes adjoining Little Dip Conservation Park. Details: From $29/night, The Esplanade, Robe, https://www.big4.com.au/, (08) 8768 2237. The only one of its kind on Cradle Mountain, this caravan park is perfectly situated on the edge of the World Heritage-Listed area, allowing guests to explore the wild landscape with ease. You can even hire mountain and quad bikes or book horse riding trips from reception. 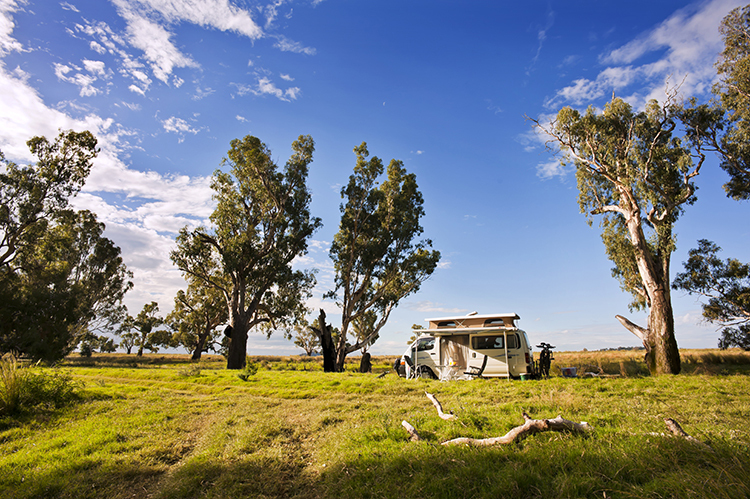 Breathe some of the cleanest air in the world and enjoy the rugged wilderness with the possums and kangaroos that will greet you at your caravan door of an evening. Don’t miss: The hypnotic display of stars that light up the night sky. Details: From $35/night, Cradle Mountain Rd, (03) 6492 1395. Built by convicts, Port Arthur Historic Site is an important reminder of Australia’s past. Its well-preserved buildings and prison facilities have made it one of Australia’s top tourism destinations. But after a long day of sightseeing, all you want to do is relax; only ten minutes from Port Arthur, this park is surrounded by white ghost gums, sandstone cliffs and the clear blue ocean. It’s the perfect place to rest your head. Don’t miss: A chilling ghost tour of Port Arthur. Details: From $26/night, White Beach Rd, Nubeena South, (03) 6250 2142. Not many people can say they’ve slept at the foot of the remains of a giant volcanic plug. You could join this rarefied list by pulling in to Stanley Cabin and Tourist Park, right beneath the astonishing landmark known as “The Nut”. Owned and operated by helpful locals Fiona and Tim, who encourage guests to explore the area, this park is a bird-watchers delight as The Nut is a haven for migratory birds such as shearwaters, orange-bellied parrots, kestrels, falcons and fairy penguins. Don’t miss: Take the path (or the chairlift) the 152m to the top of The Nut and enjoy views up and down the coast. Details: From $24/night, Wharf Rd, Stanley, (03) 6458 1266. The Bay of Fires is like a well-kept secret you’re busting to tell everyone about. A classically colourful Bay of Fire aspect. Its white sand beaches, sparkling emerald waters and red-capped rocks come together to form a picture of coastal perfection – but without the crowds usually associated with such spots. Just 10min away is the award-winning St Helens Caravan Park. Whether it be fishing, swimming or walking that takes your fancy, this park has it all. But hurry – it won’t be a secret for long. Don’t miss: Lunch at Angasi Restaurant, which has magnificent views of the Bay of Fires. Details: From $27/night, Penelope St, St Helens, (03) 6376 1290.